Western floor of Giordano Bruno crater. LROC NAC M110919730L, 0.61 m/pixel, image width is about 737 m. Illumination is from the lower right, incidence angle is 42°. This image from NASA's Lunar Reconnaissance Orbiter (LRO) looks like a parched Arizona mudflat after a monsoon downpour. Not quite! You are looking at the broken surface of an impact melt pond inside Giordano Bruno crater. A surface crust fragmented into angular blocks up to about 40 meters in width as still molten rock was drained from beneath a hardening crust. 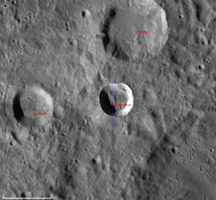 The small clusters of relatively bright rock fragments are likely boulders that rolled down from the nearby steep walls.